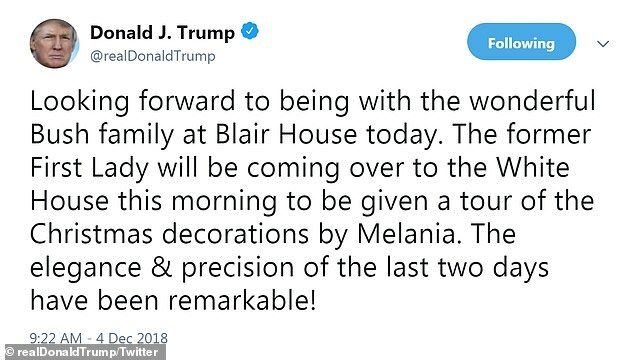 President Donald Trump threatened on Tuesday to place ‘major tariffs’ on Chinese goods imported into the US if his administration is unable to reach an effective trade deal with Beijing. ‘We are either going to have a REAL DEAL with China, or no deal at all – at which point we will be charging major Tariffs against Chinese product being shipped into the United States,’ the president tweeted. 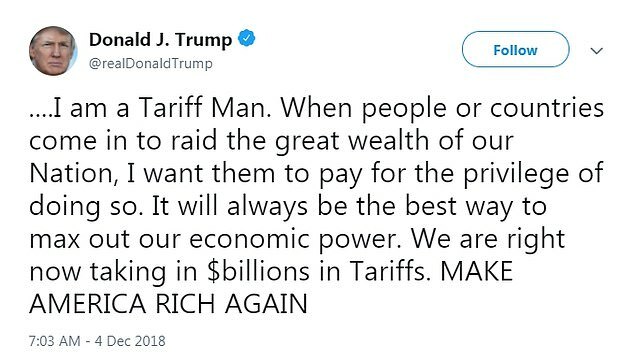 ‘Ultimately, I believe, we will be making a deal – either now or into the future…China does not want Tariffs!’ Trump added. The Trump administration raised doubts about the substance of a US-China trade cease-fire, contributing to a broad stock market plunge and intensifying fears of a global economic slowdown. 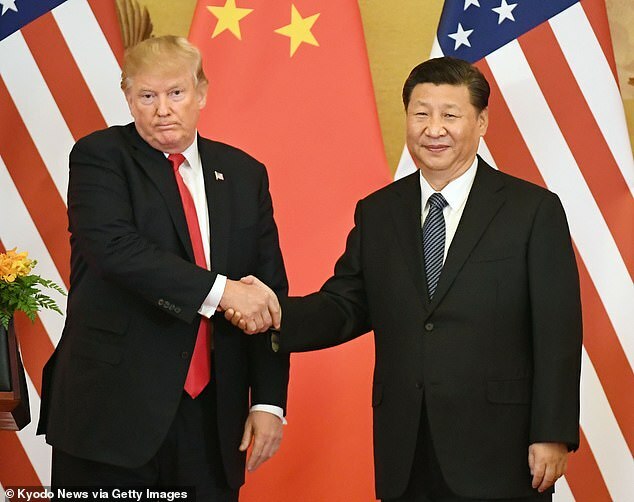 Investors had initially welcomed the truce that the administration said was reached over the weekend in Argentina between Presidents Trump and Xi Jinping – and sent stocks up Monday. But on Tuesday, after a series of confusing and conflicting words from Trump and some senior officials, stocks tumbled, with the Dow Jones shedding about 800 points, or 3.1 per cent. ‘The sense is that there’s less and less agreement between the two sides about what actually took place,’ said Willie Delwiche, an investment strategist at Baird. 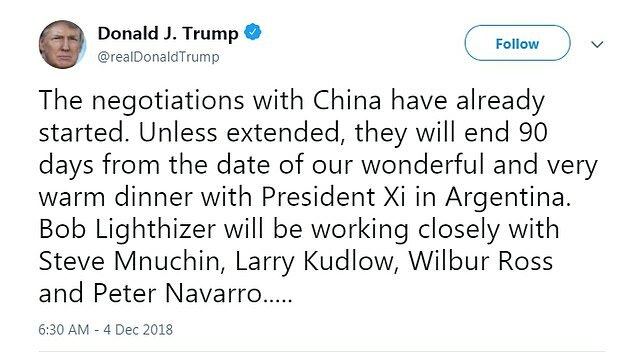 Trump and White House aides have promoted the apparent US-China agreement in Buenos Aires as a historic breakthrough that would ease trade tensions and potentially reduce tariffs. They announced that China had agreed to buy many more American products and to negotiate over the administration’s assertions that Beijing steals American technology. 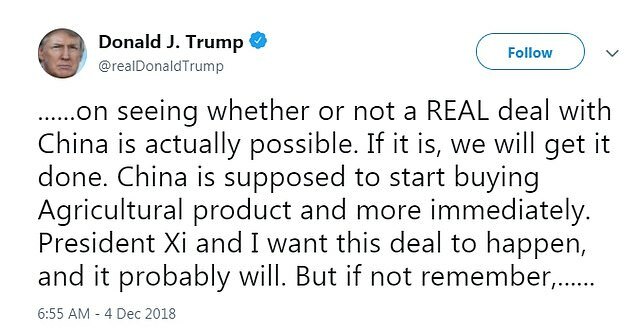 ‘President Xi and I want this deal to happen, and it probably will,’ Trump tweeted. Trump added that a 90-day timetable for negotiators to reach a deeper agreement had begun and that his aides would see ‘whether or not a REAL deal with China is actually possible’. 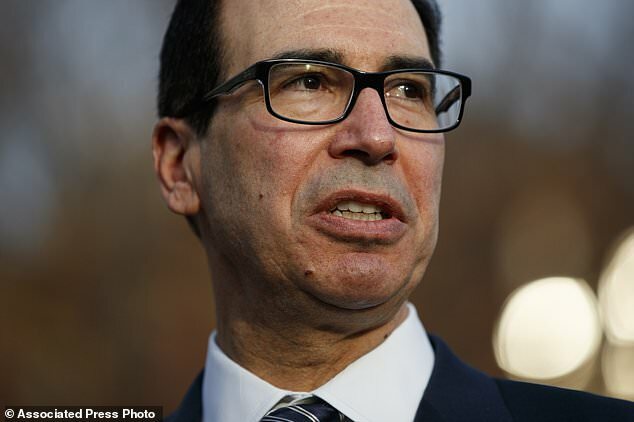 In addition, Treasury Secretary Steven Mnuchin said Tuesday on the Fox Business Network that China agreed to buy $1.2trillion of US products. 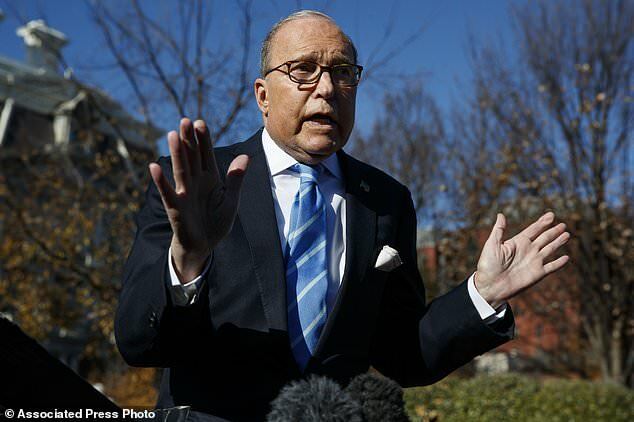 But Mnuchin said, ‘If that’s real’ – thereby raising some doubt – it would close the US trade deficit with China, and ‘we have to have a negotiated agreement and have this on paper’. ‘The actual amount of concrete progress made at this meeting appears to have been quite limited,’ Alec Phillips and other economists at Goldman Sachs wrote in a research note. In return for the postponement in the higher US tariffs, the White House said China had agreed to step up its purchases of US farm, energy and industrial goods. Most economists noted that the two countries remain far apart on the sharpest areas of disagreement, which include Beijing’s subsidies for strategic Chinese industries, in addition to forced technology transfers and intellectual property theft. ‘It’s impossible for China to cancel its industry policies or major industry and technology development plans,’ said economist Cui Fan of the University of International Business and Economics in Beijing.